The C2000H/L/S is the ideal choice to Refrigerate / Freeze medium size panel vans down to -20°C. 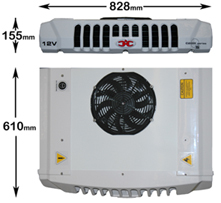 Slimline Condenser 155mm high capable of producing a powerful 1950W of cooling power. Environmentally friendly R-134a and R404a refrigerants. S models suitable for product temperatures down to -20°C.